Jean Honoré Fragonard (French, 1732-1806)—one of the most forward-looking and inventive artists of the 18th century—was equally skilled in painting, drawing, and etching. Yet, unlike many old masters for whom drawing was a preparatory tool, Fragonard explored the potential of chalk, ink, and wash to create sheets that were works of art in their own right. As displays of virtuosity and an imaginative spirit, his drawings were highly prized from his own day to the present, and New York has long been a center for collecting these works. The exhibition Fragonard: Drawing Triumphant—Works from New York Collections, opening October 6 at The Metropolitan Museum of Art, will celebrate the artist's achievements as a master draftsman. A similar brio and inventiveness mark the artist's etchings, and examples of these will also be featured. Among the 100 works on paper on view, nearly half are from private collections, some of which will be shown publicly for the first time. The exhibition will thus provide a rare opportunity to see well-loved masterpieces alongside new discoveries and works that have long been out of the public eye. Fragonard's career took place in the later 18th century when the role of drawing was undergoing a critical transformation. No longer regarded solely as a step in the genesis of another work, drawings were appreciated by a growing audience as original works by the artist's hand, precious manifestations of creative inspiration. As the century progressed, sheets by living artists appeared at public auctions with growing frequency, suggesting either that they were made for the market as independent works of art or that the value assigned to such works provided an incentive for artists to part with them. The freedom and speed afforded by chalk or wash on paper were particularly suited to Fragonard's improvisational talents and allowed his creative genius to shine. Among the subjects for which he is best known are joyful images of daily life, portraits, and landscapes, as well as episodes from the Bible and from diverse works of literature, ranging from the fantastic to the licentious. The frolicking children, young lovers, and sunlit gardens that sprang from his imagination are not weighed down by specificity or detail, but rather speak to the universality of such themes. By uniting works in The Met collection with loans from other New York City museums and private collections, the exhibition will represent Fragonard's entire range and achievement as a draftsman at the highest level. The selection will embrace the full spectrum of his career as well as all the genres in which he worked. In technique, they range from the most spontaneous sketches to highly worked studio pieces, intended to be framed and displayed. The exhibition will follow the chronology of the artist's life, from his early training in Paris in the studio of François Boucher, to his training at the French Academy in Rome, to his return to the French capital, and ultimately to his break with the official arts establishment. By spurning royal patronage in order to work for private clients, Fragonard gained the freedom to choose his own subjects and formats, thus contributing to our modern view of the artist as innovative and independent. Groupings within this chronological framework will illuminate Fragonard's practice of revisiting themes and compositions he had already explored to create new works in a different medium or technique. Cross-fertilization and play between media were central to his working method. A highlight will be the display of all five of the works on paper—three drawings, an etching, and a gouache—related to his famous composition The Little Park (Le petit parc). The constellation of works on this subject will be reunited for the first time since the artist's lifetime, providing important insight into his working methods. Also on view will be many pairs of works whose compositions echo one another, experimental variations on themes, often in different media. Four major sheets acquired by The Met in recent years will also be featured. A Gathering at Woods' Edge depicts a lush scene of well-dressed visitors finding respite at the shady entrance of a sunlit grove of trees, rendered in a vibrant yet precise manner in red chalk, also called sanguine. Later and equally masterful are two large-scale studies of fishermen drawn at the edge of the sea in Naples, where Fragonard visited in 1774. Acquired in 2009, Rinaldo in the Enchanted Forest is fueled more by imagination than by observation, as Fragonard used layers of fluidly applied gold-brown wash to produce, seemingly effortlessly, the dramatic tenor of a brave warrior battling magical creatures. The exhibition is organized by Perrin Stein, Curator in the Department of Drawings and Prints. Exhibition design is by Brian Oliver Butterfield, Senior Exhibition Designer; graphics are by Chelsea Amato, Graphic Designer; lighting is by Amy Nelson, Lighting Designer, all of the Museum's Design Department. The exhibition will be accompanied by a catalogue published by The Metropolitan Museum of Art and distributed by Yale University Press. Original information about the role of drawing in Fragonard's practice will be addressed in essays and catalogue entries by Perrin Stein and prominent Fragonard scholars Marie-Anne Dupuy-Vachey and Eunice Williams. The catalogue will be available for purchase in The Met Store ($65, hardcover). Education programs include a Friday Focus lecture, exhibition tours, and a conversation with the curator in the galleries. The exhibition will be featured on The Met website, as well as on Facebook, Instagram, and Twitter via the hashtags #DrawingTriumphant and #MetonPaper100. 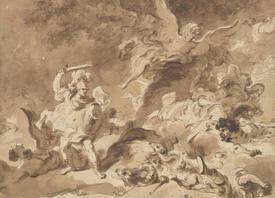 Fragonard: Drawings Triumphant—Works from New York Collections is one of a series of exhibitions and programs organized to celebrate the centennial of the Department of Prints and Drawings at The Met, one of the most comprehensive and distinguished collections of works of art on paper in the world. The centennial began in January 2016.